Esquire Online Store - Shogun Bros. The Shogun Bros. Chameleon X-1 Gamepad Mouse is a patented and unique product that combines a wireless mouse, wireless gamepad, and a wireless presenter, all in one device. the Chameleon X-1 can attach to any Windows PC or Mac without needing to install drivers, and switches to different modes freely by the use of one button. The X-1 is an all-in-one device that easily switches between three transformations using one button. Change usage in an instant by using the button on the mouse to switch between Mouse Mode, Gamepad Mode, and Presenter Mode. Whether traveling with your laptop, playing your favorite games, or presenting at a business meeting, the Chameleon X-1 is one portable wireless device that can do it all. It's completely plug-and-play--simply plug in the wireless nano receiver to your PC or Mac via USB and it's ready to go right out of the box. The X-1 runs on a single AA battery--use a rechargeable AA battery and save on waste and energy costs versus using multiple batteries across three devices. The rechargeable battery will even recharge itself when the X-1 is plugged in via the included USB cable. Store the wireless nano receiver in the magnetic internal storage compartment of the X-1 when you're traveling for an easy way to keep things organized. The "gamer grade" Pixart optical sensor features an adjustable dpi setting, from 400 to 1600dpi. 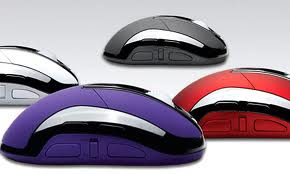 The durable silicon base allows for excellent grip and features an ergonomic design that's comfortable in the hand. Seven programmable buttons and a scroll wheel give you access to all your application functions, and works great as a wireless gaming mouse. As a wireless gamepad, the Chameleon X-1 features 16 buttons and two analog sticks to support all your favorite computer games. It even has force feedback for an extreme realistic and shocking experience. The X-1 also features a "flip back" mode that allows you to use it as both a mouse and a gamepad within the same game, as needed. Precision button molds deliver reliable and durable button operation for a long gaming life, with a 1.5mm button travel distance for the best comfort and response. Use the X-1 at your next business meeting to guide PowerPoint presentations with one hand. In Presenter Mode, the X-1 lets you turn the mouse to a one-handed grip with PowerPoint show/slide control and cursor access. Use the analog stick for wireless cursor movement with left and right click functionality. You can also use the Chameleon X-1 as a one-handed home theater PC remote, with support for media center functions such as play and pause, volume, track forward and back, and more. With the ability to switch back and forth between a mouse and a media remote, the X-1 is the ultimate multimedia PC device.